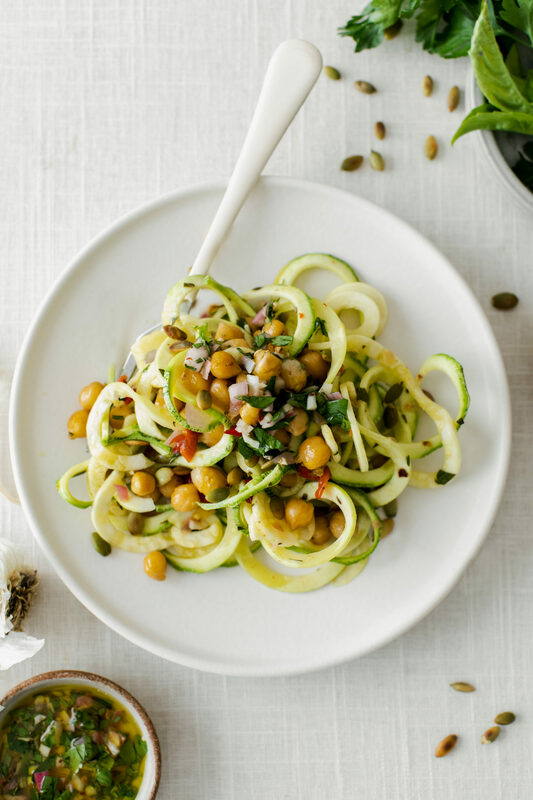 Chimichurri Chickpea Zucchini Noodles | Naturally. I’m squeezing in a few more summer recipes before October hits. I feel the change to fall in the air but at least in California, summer produce is still quite prominent at the markets and stores. This recipe was voted on in my instagram stories and I’m so glad people wanted to see it. This chimichurri chickpea mix is ridiculously simple and this entire meal comes together fast. I’m not a pasta-avoider (give me all the carbs!) but sometimes it’s nice to have a light idea in my back-pocket, especially when I’m still swimming in zucchini. For the noodles, you can really use any size you want. I have a simple metal spiralizer and use the medium-sized blade. Also, don’t salt the noodles. I know some people say this is a must but all that does is draw moisture out and make for some soggy noodles. Fresh is best! Grains: I’ll admit this bowl isn’t SUPER filling but there are ways to bulk it up. Add cooked grains to the dish or swap the zucchini for a full serving of grains. Quinoa and barley are a couple of my favorite. Lentils: Swap out chickpeas for green or black lentils. This is a great alternative if you don’t have any cooked chickpeas on hand. 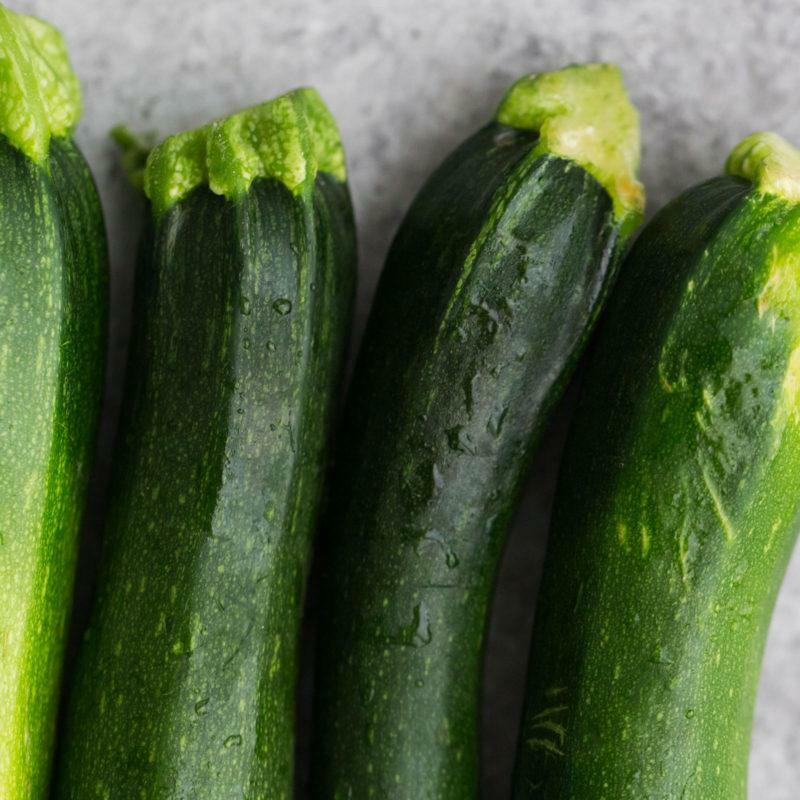 Salad: Similar to the grain bowl, add in or swap out the zucchini for greens. If I’m making a salad, I also usually toss in a handful of cooked grains too. another great mix of ingredients, thank you, and still love the zucchini for pasta swap, love pasta but it doesn’t love me back! 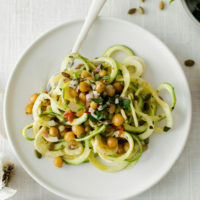 This Chimichurri Chickpea Zucchini Noodles looks perfect for our upcoming reunion next week! My relatives would definitely love it. Although is it possible to omit the sherry vinegar or are there other substitutes that you can recommend me to use instead? Thank you, Erin! Hi! You could swap in apple cider vinegar!